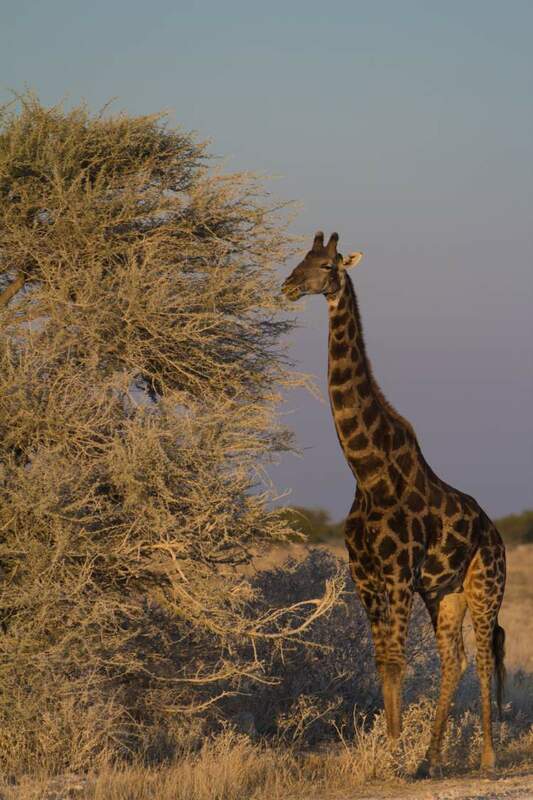 Departing every Monday, this budget safari incorporates the best that Namibia has to offer and is the best value for money tour you will find. 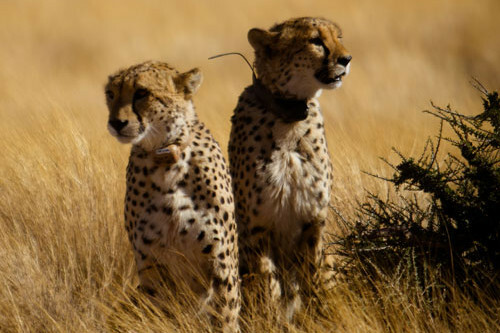 Starting in Windhoek with a tour of N/a'ankuse, where you can see the feeding of large predators like lions and wild dog, before heading up to Etosha to search for wildlife in their natural habitat. Making your way down to Swakopmund via the skeleton coast to try out some adventure activities, before moving on down to the Sossusvlei area and experiencing the Namib Desert in all her majesty. 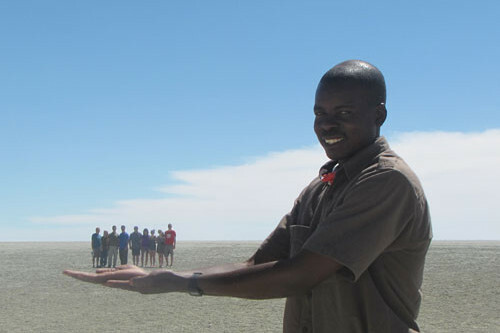 All the top highlights of Namibia rolled into this lovely little package for your enjoyment. 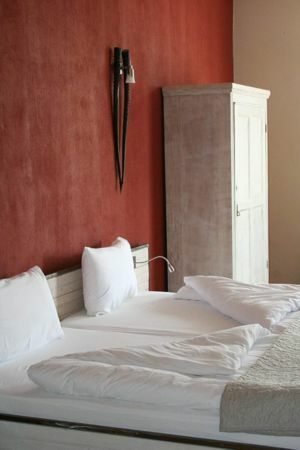 You are collected from the airport (must arrive prior to 13h00) or bus terminal on arrival and transferred to the centrally located Chameleon Guesthouse. 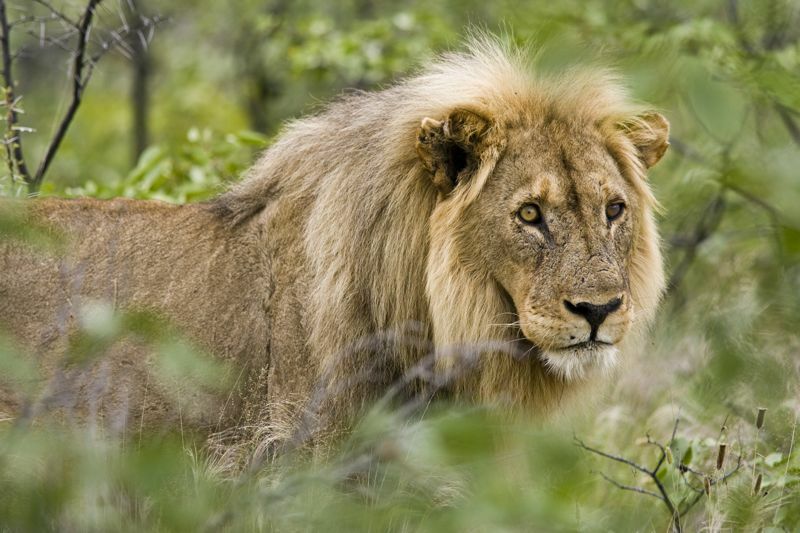 This afternoon you will join the afternoon feeding tour at N/a’ankuse Lodge, here you have wonderful photographic opportunities of the large predators such as lion, leopard and wild dog to name a few, that are unable to be re-located back into the wild and learn more about these fascinating animals. You can then enjoy sundowner drinks before returning to Chameleon Guesthouse for dinner (own expense at restaurant of choice). 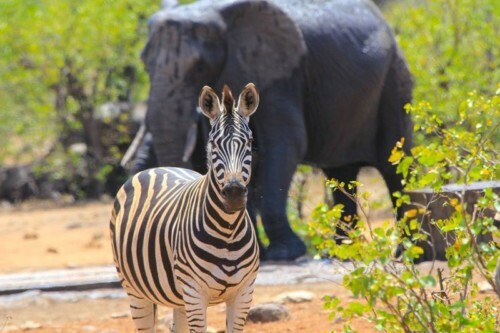 Your visit to N/a’ankuse supports the project and helps with the costs of keeping these majestic animals alive. Overnight twin share room with en-suite facilities. You should be ready at 07h30 as the group meets for a pre-departure talk before we depart. We stop briefly at Otjiwarongo and enjoy a light lunch pack “on the move” before entering Etosha National Park through the Anderson Gate. 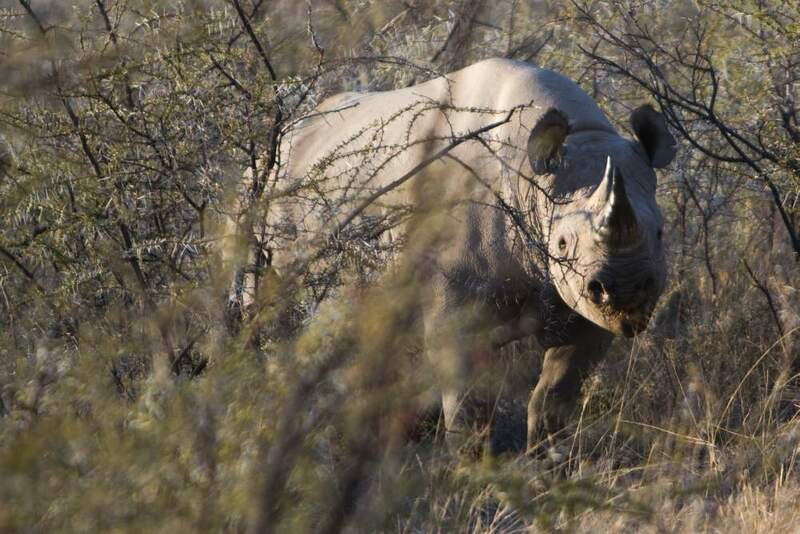 We enjoy an afternoon game drive through the park visiting waterholes looking for predators as well as zebra, giraffe, elephant, rhino and many different species of antelope. We arrive at our lodge just before sunset and settle into our rooms, with en-suite bathroom and tea/coffee facilities. 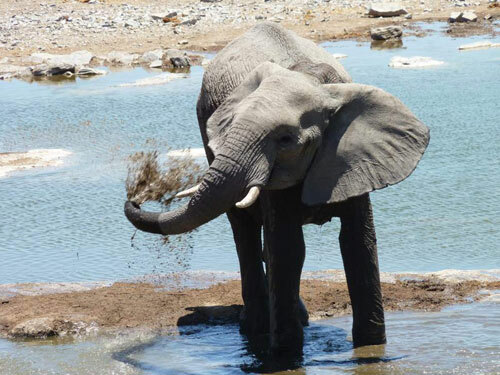 We highly recommend spending time at the floodlit waterhole while dinner is prepared by your guide over an open fire and an early night is recommended. We start our first game drive at sunrise to catch the predators while they are still active, visiting many waterholes and return to Halali for breakfast. 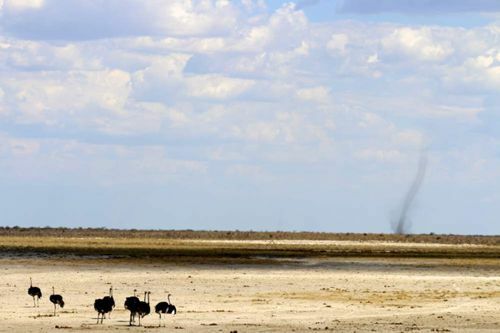 Our second game drive mid-morning takes us to the impressive Etosha Pan “great white place” where you can get out of the vehicle and experience this 4500 sq km “saline desert” before continuing your game drive to look for the Big 4. We arrive back at Halali where your guide will prepare you a delicious lunch whilst you have a dip in the pool or relax by the camp waterhole. After lunch you will have a chance to relax before our final game drive across the park towards Okaukuejo calling into some well-known waterholes and leave the park prior to sunset. Accommodation tonight is just outside the park in twin share permanent tents with en-suite bathroom facilities. Dinner is prepared by your guide and another early night is recommended. 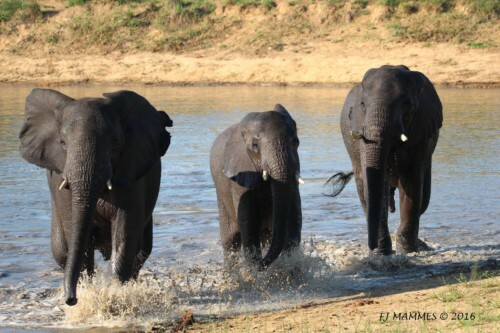 Enjoy an early morning breakfast and departure from your lodge is at 07h30. Your route today takes you into the dramatic and beautiful scenery of Damaraland. You have the chance to meet the wonderful Herero ladies who sell their handmade arts and crafts to support their rural families. A light roadside lunch is served en-route in the shadow of Namibia’s tallest mountain, the Brandberg, and you can interact with some of the colourful local characters who live in this harsh environment. On the drive down the Skeleton Coast we explore the remains of a small shipwreck. Arrive in Swakopmund early afternoon where you will have the chance to explore this quaint seaside town on foot and enjoy a coffee and cake in one of the many cafes. Overnight accommodation at Hotel A La Mer (or similar) in en-suite rooms on a twin share basis. Sample one of the many great restaurants for your evening meal (own expense). We highly recommend a visit to the Aquarium or Museum (unguided and own expense) near the town centre of Swakopmund or for the adrenalin junkies, join the 2 hour sand boarding trip into the sand dunes. You will be picked up from your guesthouse/hotel in Swakopmund at 11:15, (wintertime 10h15) for a brief pre-departure talk. Driving via Kuiseb Canyon and Solitaire we arrive at our camp late afternoon and have a chance to relax and enjoy the views before taking a short walk for sunset overlooking the Naukluft Mountain range. Overnight in twin rooms/permanent tents with en-suite bathroom facilities. Pool and bar available. Dinner prepared by your guide over an open fire. Dawn departure from lodge to arrive at the park gate for sunrise. 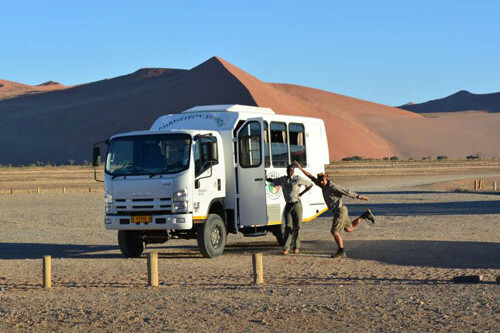 We drive down an ancient river bed surrounded by towering dunes to the 2×4 parking (around 55kms) and take a 4×4 shuttle into the Sossusvlei area to appreciate the beauty of this place in early morning light and enjoy the peace and tranquility of the region. We explore this unique area on foot before heading into Dead Vlei with its large expanse of bleached cracked clay and skeletal camel thorn trees, contrasting with a backdrop of huge dunes with their ever-changing colours. We can either walk or take the 4×4 shuttle back to our vehicle. As we drive back to our accommodation we will stop at the famous Dune 45 and climb this dune if we wish or just wander around the base. We return to Sesriem and visit the nearby Sesriem Canyon, one of the few permanent water sources before arriving back at our lodge late afternoon to watch the sunset over this spectacular desert. Overnight in twin share rooms/permanent tents with en-suite bathrooms. Dinner prepared by your guide. Early morning breakfast before heading to Solitaire Guest Farm where we join a biologist to track wild cheetahs at the Namib Conservation Centre. We return to Windhoek via the Naukluft Mountains and Rehoboth. On arrival in Windhoek, mid-afternoon, you will be dropped at your accommodation of choice or transferred directly to the International Airport for your onward flight, or to the bus terminal for your overnight bus. For those flying today we do NOT recommend booking any flight departing prior to 17h00 in case there are unexpected delays returning from safari. Services end on arrival in Windhoek or after your transfer. Between the 1st January and the 31st March there is a National Park Supplement Fee of R510 on this tour. Transport, Guide, Accommodation, Meals as indicated, Return Transfers between airport and pre-departure point. Starting in Windhoek with a tour of N/a’ankuse, where you can see the feeding of large predators like lions and wild dog, before heading up to Etosha to search for wildlife in their natural habitat. Making your way down to Swakopmund via the skeleton coast to try out some adventure activities, before moving on down to the Sossusvlei area and experiencing the Namib Desert in all her majesty.